Over this last weekend, I was up in Tacoma helping 15 Now Tacoma campaign for their initiative. Among other things, Initiative One not only really calls for an immediate $15/hour minimum wage (as opposed to in two to seven years from now), it criminalizes wage theft. That’s huge. After all, if a worker steals from the boss, that’s a felony, but if the boss steals from the worker (by not paying him or her the right amount), that’s not even a misdemeanor. On my first full day there, we went to a blood donation center. That’s where the capitalists literally get their pint of blood — workers who are so broke that they have no other means of eating but to sell their blood. Within a few minutes, the manager of the blood center was out harassing us and telling us we couldn’t distribute our literature there. Shows how much the capitalists believe in freedom of speech! We went a few feet away, where we were able to talk with the donors anyway. A common theme that people raised was “how about those who don’t even have a job of any sort?” That’s a valid question, and we’ll have to address it. But quite a few people did support the initiative. One young guy expressed real appreciation for what we were doing. “God bless you,” he said. That was one of the very few times I’ve been told that that I didn’t mind it! The next day I went with another 15 Now activist and did doorbell ringing. We had a list of voters and their addresses. The first two doors we knocked at were strong supporters who both said they’d like to have a yard sign when these get printed up. I would guess that 50-60% of the people we talked with were supporters. One guy, though, was quite hostile, said he was not in support of any raise in the minimum wage and nearly slammed the door in our faces. When I turned around, I saw his truck parked in front of his house — he was a building contractor! No wonder! Several union locals have endorsed 15 Now, and even a layer of the union leadership is swinging around into support. I think the reason is that they figure that most voters that come out to support this initiative will also support “their” candidates for office. The 15 Now activists I met were inspirational. They included a low wage single mother, an unemployed guy, and some slightly older people (like myself). We also have had supporters coming down from Seattle, and they are a great help. I think there’s no doubt that if the union leadership would even half mobilize their membership that Initiative One would sweep to victory. That is despite the fact that the Democrats in Tacoma have pulled the trick of putting Initiative One B on the ballot. This raises the minimum wage to $12 in two years from now, and if it gets more votes than Initiative One, it will override it. 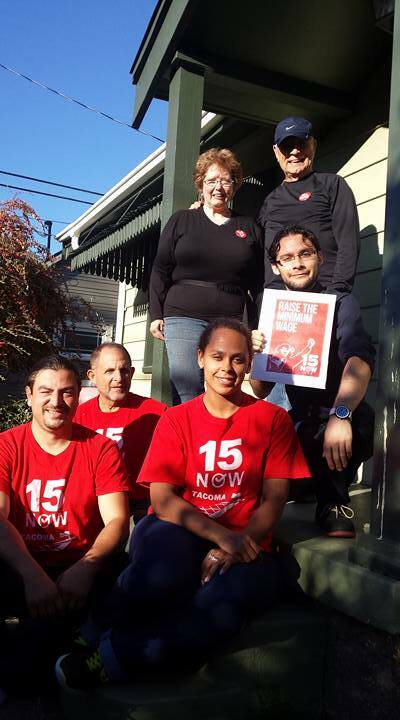 It’s no secret that 15 Now Tacoma is a small force without a great deal of resources, but their efforts have already wrung this concession from the Democrats and their big business backers. I would urge anybody who lives near Tacoma to get involved in this campaign, which is truly a grassroots campaign. And whether you live near there or not, your donations are a great help. You can donate online here.